Earn $53.93 in VIP credit (5393 points)What's This? Electronic 11 speed shifting meets hydraulic disc braking with the R785 Di2 Shift/Hydraulic Shifters. For their first foray into road (or cyclocross) hydraulic disc brakes, Shimano has rolled out the non-series, R785 shifters. At what is essentially the Ultegra level, these combine the 11 speed electronic shifting of their Di2 road line and compatibility with hydraulic brakes. Just like their Dura Ace and Ultegra siblings, the R785 shifters work electronically with Shimano's Di2 system. This allows for shifting through 11 rear cogs and a double chainring setup with just the push of a button, rather than the traditional throw of the brake lever. With this system shifts are always fast and smooth, even when mashing up hills or powering through sprints. 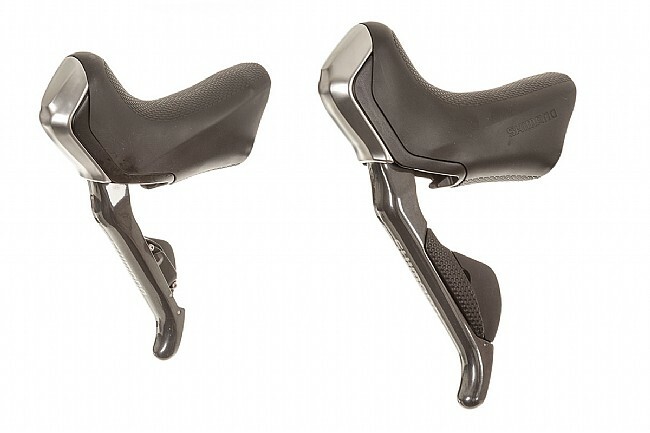 Thanks to the much smaller electronic shifting mechanism, these shifters maintain much the same appearance and feel of other electronic shifters from Shimano, with only a slight increase in height to accommodate the master cylinders for the hydraulic brakes. R785 Di2 Shift/Hydraulic Shifters come with right and left shifters and hydraulic brake cables, mineral oil, and assorted small parts. Rotors and calipers are not included and are available separately.